Our first bathroom remodeling project is complete. We are so proud of the results that I decided to blog about the remodeling experience and share the photos. I thought about tackling the kitchen first by possibly going with an Italian kitchen design. The kitchen makeover is on the list but a little further down. starting with a smaller scale bathroom remodeling project mades sense. The bathroom was a dark peach that made the entire room look even smaller. Dark spots in the wall didn't help. Previous occupants placed a darker curtain over the single window. The curtain is pretty but would be too dark for bathroom remodeling plans and is being donated to charity. After careful consideration I opted for an all white bathroom remodeling job. This makes the room look larger and better reflects existing light. 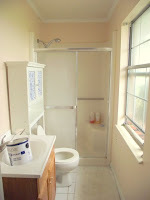 Our first task in the bathroom remodeling project was to remove the existing cabinets and light fixtures. Hubby helped do some church remodeling awhile back and was able to get this done for me. It only took a few minutes for him to do what would have taken me all day. My next challenge in remodeling was to remove the over the toilet cabinet that you see in the before photo. The bathroom is so small that it took both of us to remove the cabinet. Because this piece was in such great shape I wanted to keep it. We put it in the other bathroom where it looks good and provides needed storage. Hubby and I continued remodeling the bathroom by removing hooks from the walls and spackling the holes. My eldest daughter cleaned the floor and baseboards while I wiped down the windowsill and walls. After placing the drop cloths around the vanity, toilet and floor we were ready to paint. I chose Valspar white contractor paint in a semi-gloss latex. The guy at Lowe's said covered well and should last for years. He was right. I let the first coat dry overnight before applying the second coat. Despite some of the dark spots on the walls it only took the recommended two coats. Our future son-in-law happened to arrive in time to help Hubby replace the light fixture in our bathroom remodeling job. (He's not only taking our younger daughter off of our hands but he's a great guy!) The duo also put the new lighter curtains up for me instead of the previous curtain. 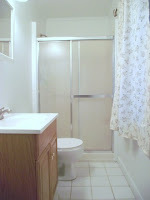 You can see from the bathroom remodeling photos that it looks great. The dark curtain was replaced with a lighter one. The room appears larger than before and seems much more airy. Removing the cabinet opened up more wall space. I made up for the loss of storage by adding racks in the vanity. We cut costs by applying a few coats of white spray paint to the light fixture. Fabric for the curtains came from my stash as did the cleaning supplies. The curtain rod and hardware were also reused. Our bathroom remodeling project only took two days to complete. We spent less than $30 on paint and about another $20 on the painting kit and supplies. To me, that was money and time well spent. What do you think? Thanks for the positive comments. We enjoy the look so much that our next repainting job is being planned! I can't wait to see how it turns out.